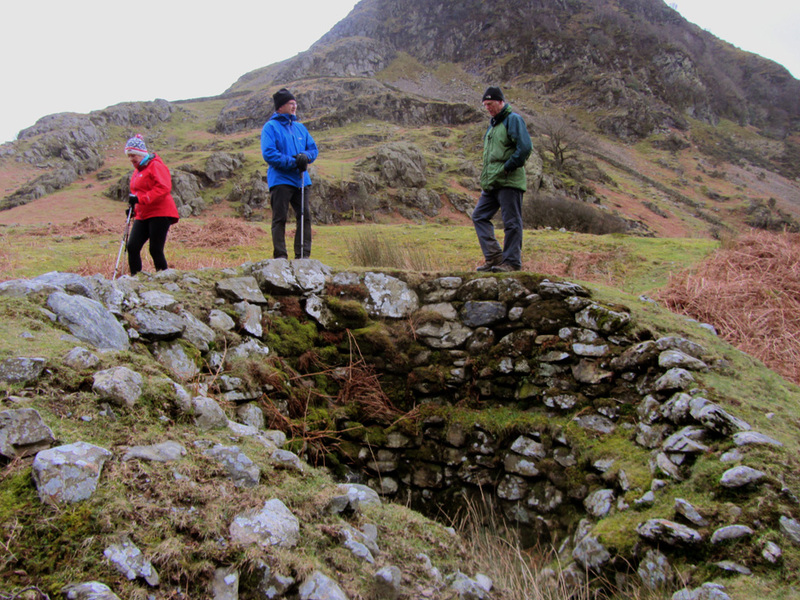 " Low Fell and Rannerdale with Trevor & Gill "
Date & start time: Mon 7th and Tues 8th February 2016. Walked with : Myself (Ann) and our dog Harry. Walk details : 4.2 mls, 1175 feet of ascent, 2 hours 45 minutes . Weather : Monday's beautiful weather full of blue skies and sunshine. 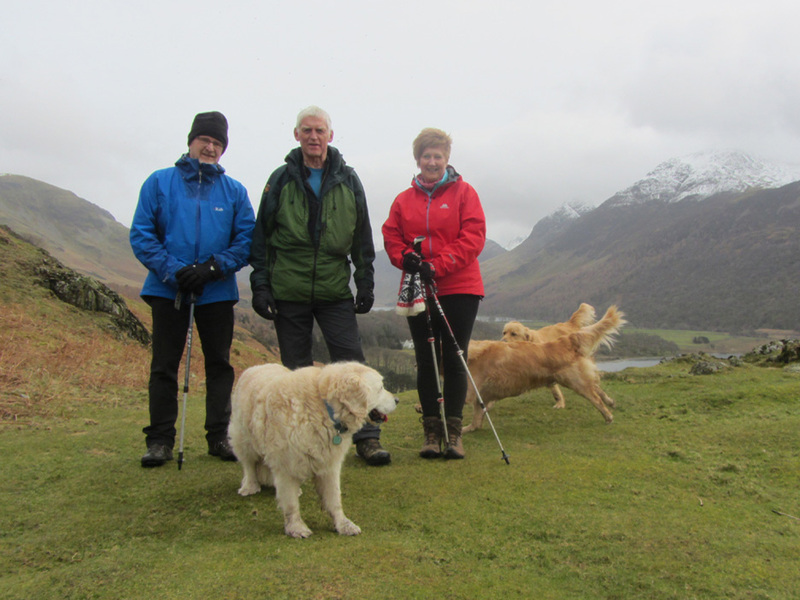 Walked with : Trevor and Gill, Ann and the dogs, Finlay (of Borrowdale) Harry and Dylan. 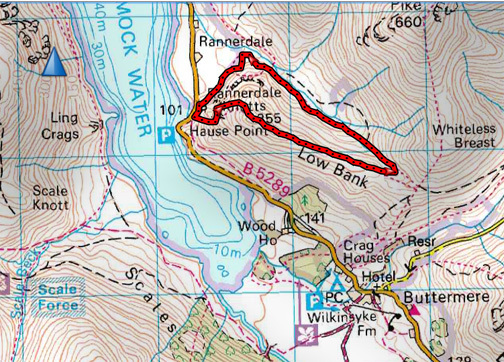 Walk details : 2.8 mls, 1000 ft of ascent, 2 hrs 15 mins. 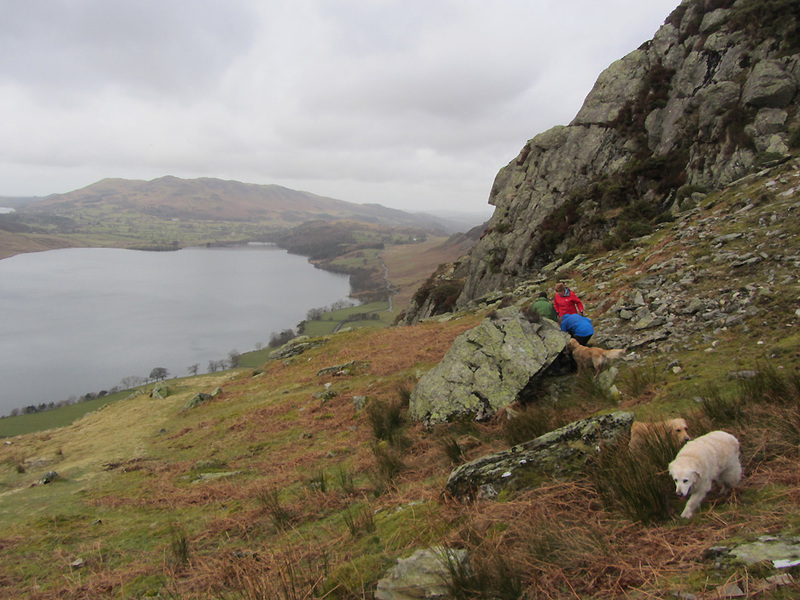 Weather : A less desirable day but we didn't get wet. 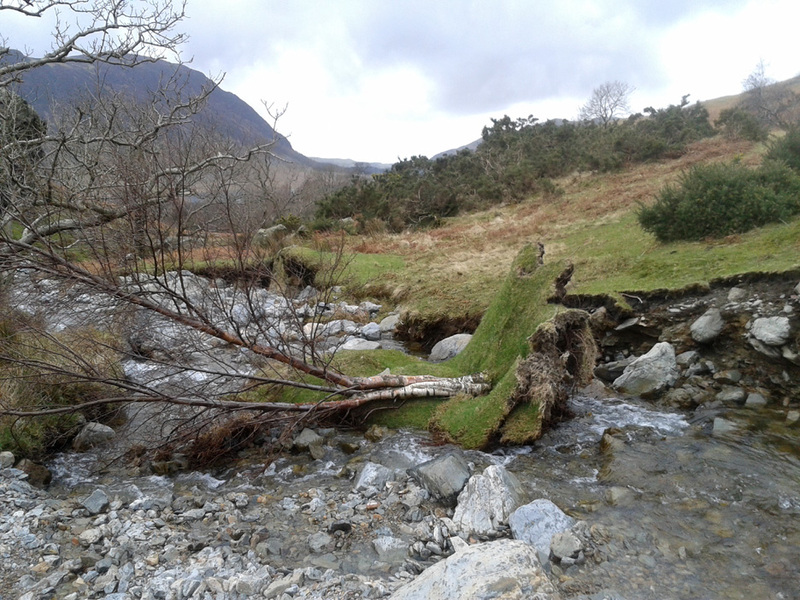 and a second walk next day when we arranged to meet up with Trevor and Gill and Finlay of Borrowdale. 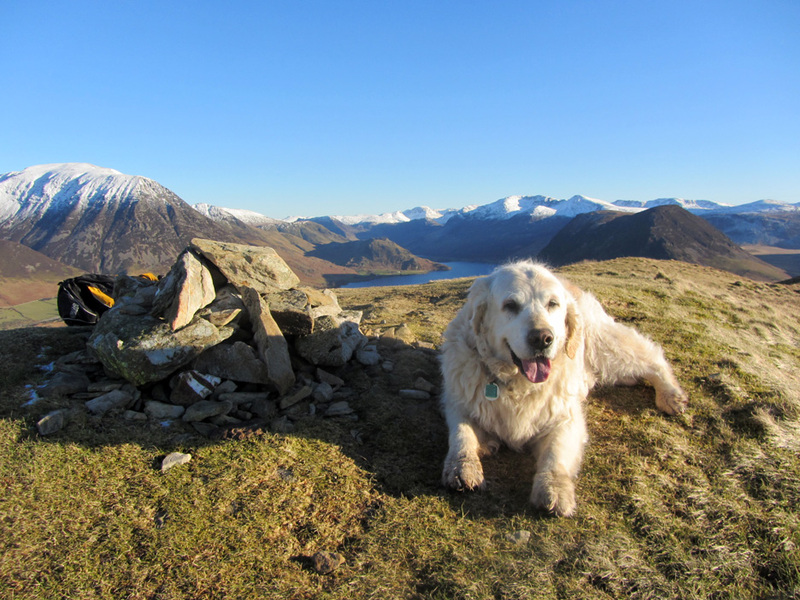 Harry was as 'Happy as Larry' on sunny Low Fell summit. 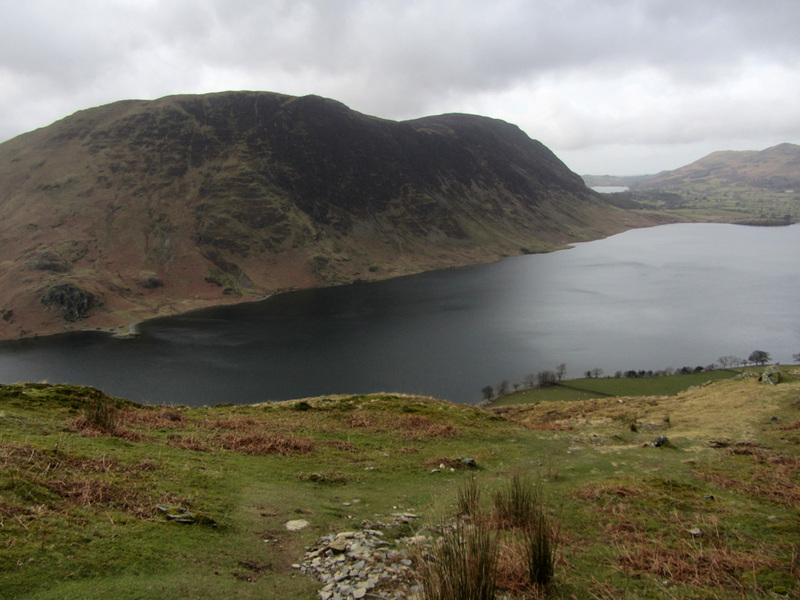 We walked the entire ridge of Low Fell from my car parked in the hamlet of Thackthwaite. This is the spectacular view from the far end. 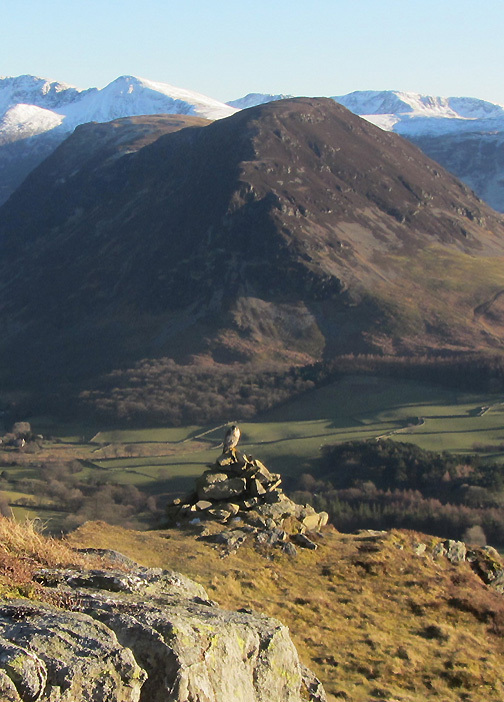 I reckon it is my favourite in the Lakes but I admit that I may be a little biased ! However, before we reached the viewpoint I was suddenly aware that something was poised on the cairn. This lovely Peregrine Falcon stayed just long enough to allow me a photo opportunity . . .
What a treat . . . and the only living thing we met on our walk ! Look carefully and you can see him making a flying exit. 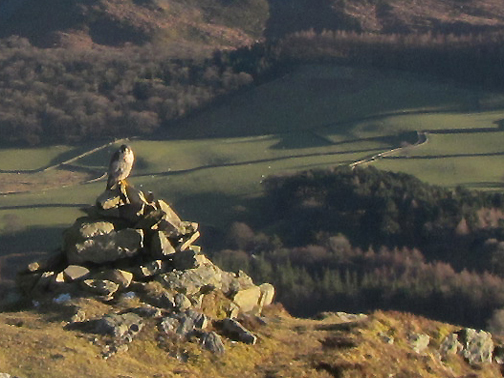 In respect of the buzzard that you saw perched on the cairn on Low Fell when you were up there with Harry? I've since looked on the larger screen of my laptop & I'm positive that it's a peregrine ..... lovely to see. 100% sure on closer inspection that it is due to the black mask like top to it's head & yellow legs. A very exciting bird to see & one for you to look out for now. never 100% on this though unless a pair are seen together. 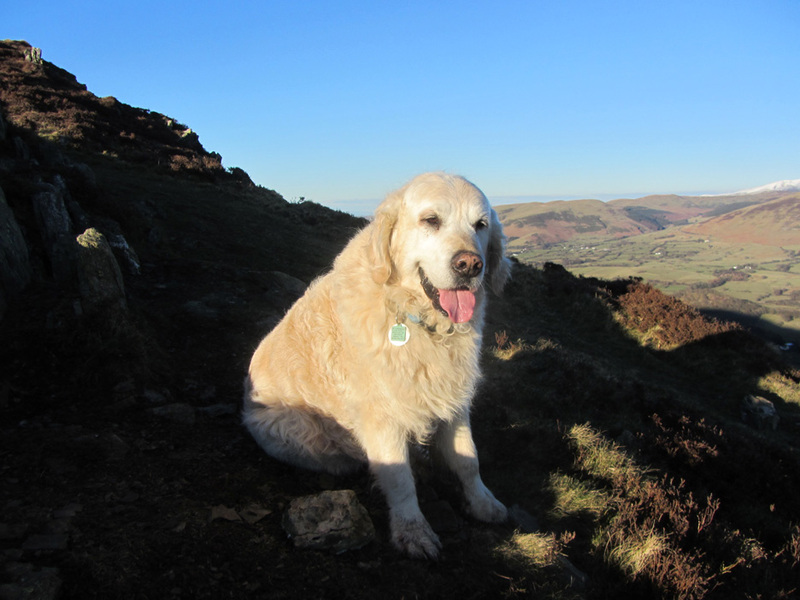 A very contented boy soaking up the sun's rays at the viewpoint. Perhaps he was also smiling at the glorious view. 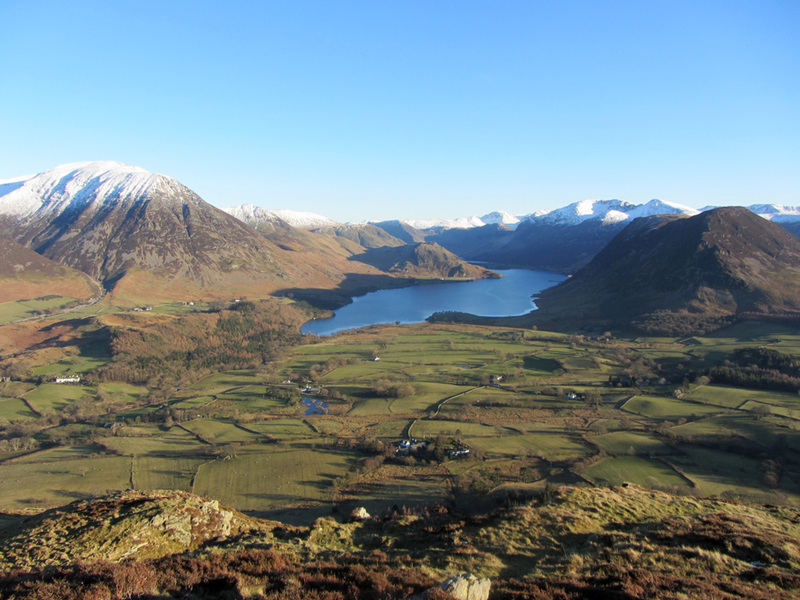 Mellbreak in the centre, a snow covered Grasmoor prominent to the left, Crummock a deep blue and a glimpse of Loweswater to the right. We had to wrench ourselves away before retracing our steps back along the ridge to the car. 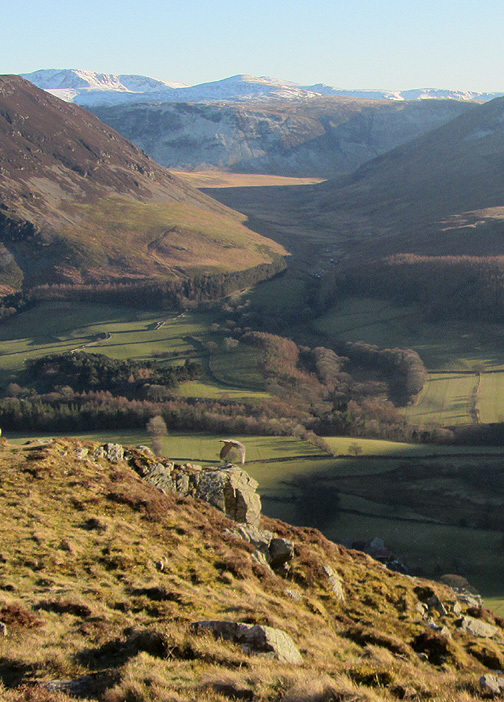 and we chose Rannerdale Knotts for a walk, a new fell for them. Harry, the old boy, keeps an eye on the frolicking youngsters ! Not too far from the top, Roger,Trevor and Gill seek out a geocache. Rather a grey lake today. After this blip in the better weather, the following few days saw a return to sunshine once again. Dylan likes to get ahead to the high ground . 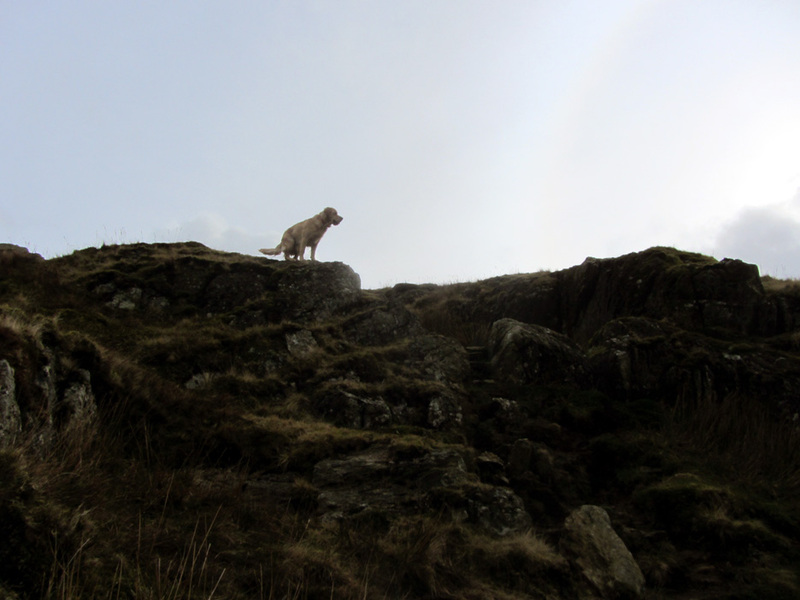 . . he waits for us to catch up. 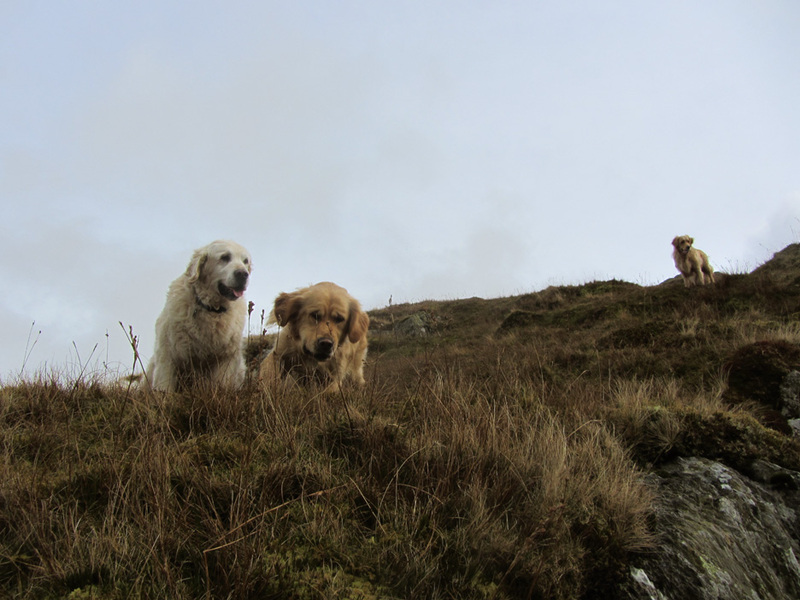 Three golden boys, Harry, Dylan and Finlay. 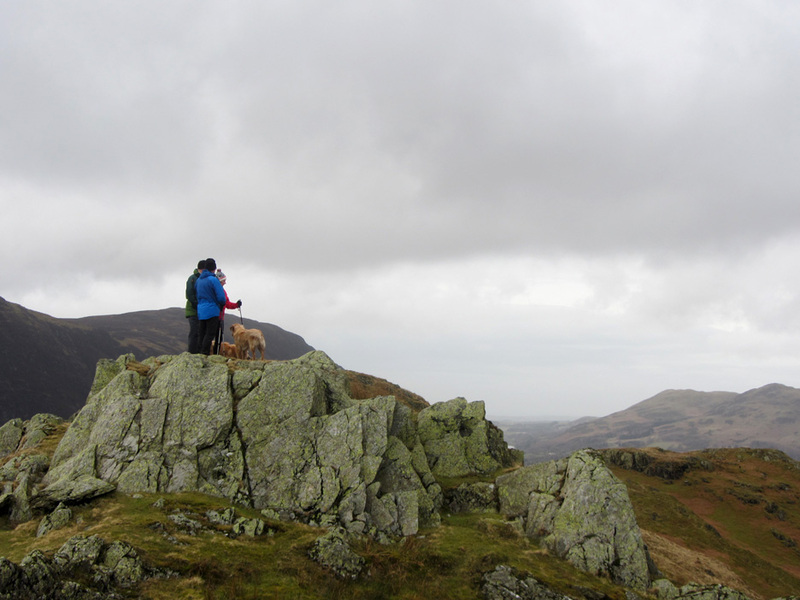 The second summit of Rannerdale Knotts. Making our way along the ridge. 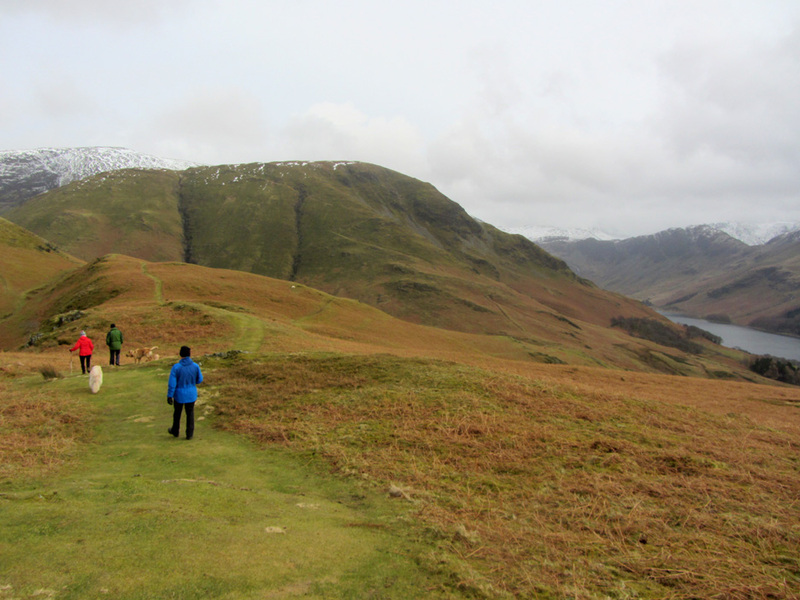 High Snockrigg and Robinson are the fells ahead. 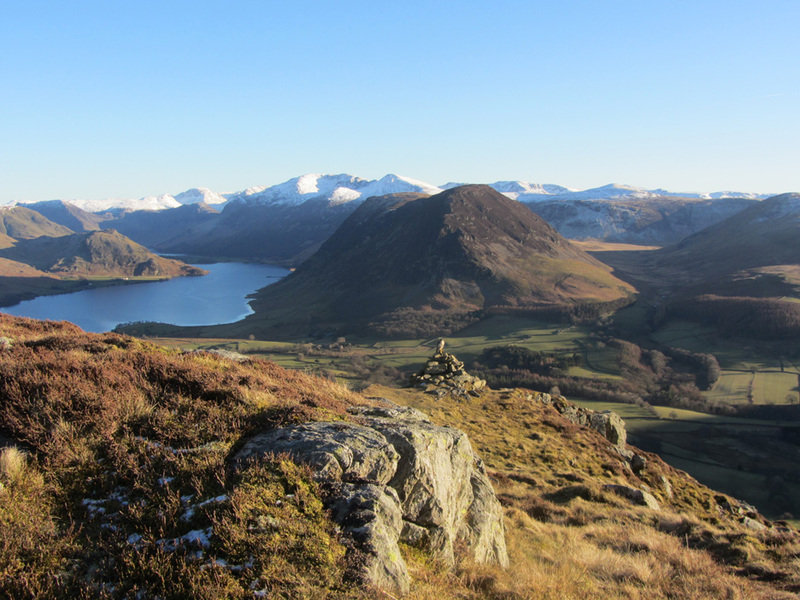 Haystacks is to the right beyond Buttermere, in front of the snowy Gable fells. A snowy Grasmoor dominates the heights above Squat Beck valley. 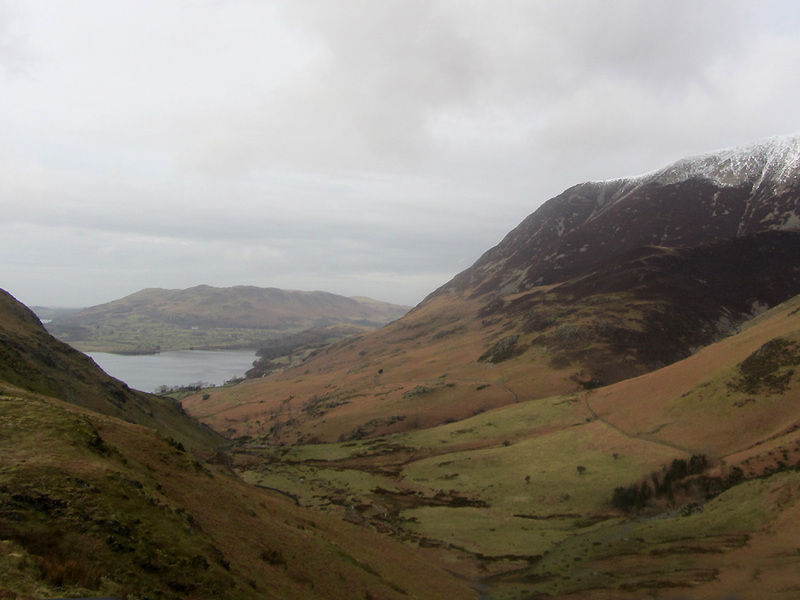 Soon after this we cut down into the valley and enjoyed this view towards Low Fell and Crummock Water. 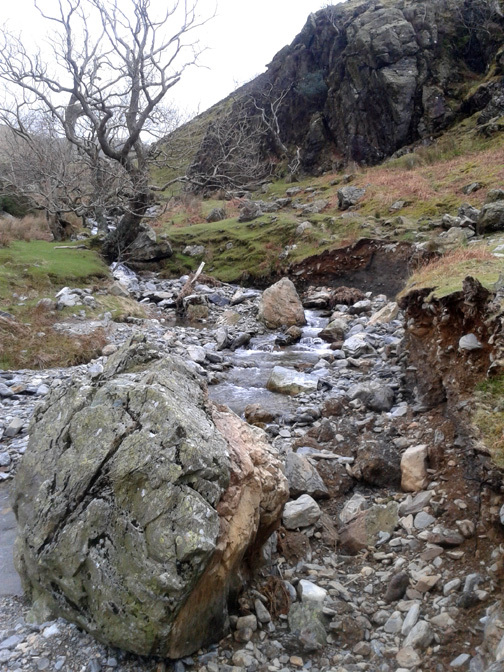 Some of the damage inflicted upon the beck and the trees alongside Squat Beck by the recent torrential winter rains. 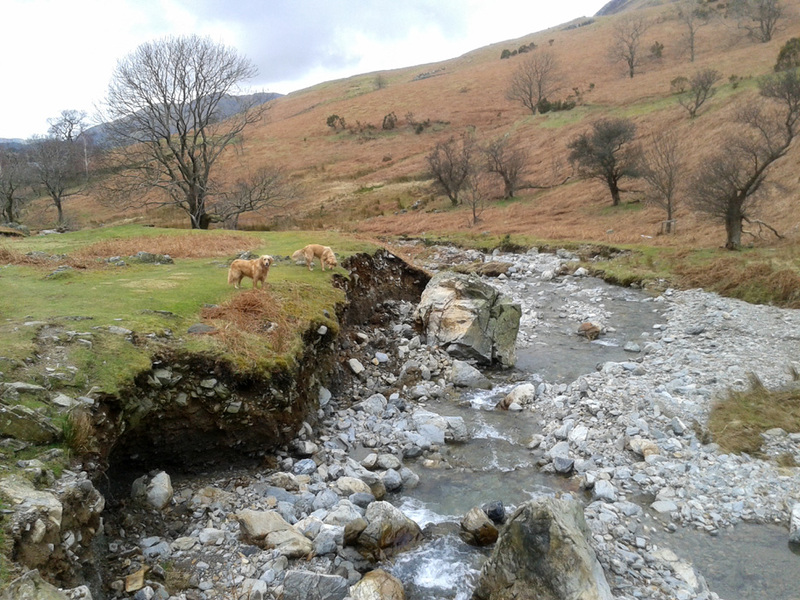 Dylan and Finlay stand on the edge of the damaged bank which suffered the loss of this huge boulder. Before returning to the car we diverted off the main path to look at the old potash bloomery. to produce a crude form of soap for cleaning wool fleeces. Technical note: Pictures taken with Ann's Canon Sureshot SX220 digital camera. This site best viewed with . . . just a wee bit of sunshine to brighten the colours.